If your knee has been damaged severely due to injury or arthritis, it might get very difficult for you to carry out simple tasks or activities like climbing stairs or walking. You might also start feeling pain when lying down or sitting. If non-surgical procedures such as the use of walking aids and medicines have not been of any use or benefit to you, it is time for you to consider knee transplantation. This type of treatment is also known as total knee replacement surgery. This is a highly effective and safe procedure that helps in relieving pain and in correcting the deformity of the leg. It can also help the patients in resuming normal activities. It was in the year 1968 when the knee replacement procedure was introduced or performed for the very first time. Since then, major improvisations have been made in the surgical techniques and materials used which has further helped in increasing the effectiveness of the procedure. At present, it is one of the most successful techniques in the field of medicine. As per reports by the Agency of Healthcare Research and Quality, there are over 600, 000 knee transplantations performed every year in America. This proves the value and the great results fetched from this scientific procedure that helps in healing knee deformities and pain. 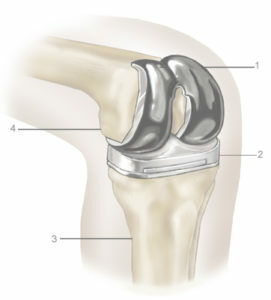 Knee transplantation is also known as arthroplasty. This is basically a surgical process for resurfacing a knee that tends to get damaged due to arthritis. Plastic and metal components are used for capping the ends of the knee bones forming the knee joint and also the kneecap. People with severe injuries to the knee or chronic knee arthritis can always go for this surgery. The process works towards relieving knee joint pain that could not be controlled by medicines and other treatments. Knee joint transplantation helps in relieving the damage caused due to arthritis of the knee. This includes both rheumatoid arthritis and osteoarthritis. Physicians and specialists generally suggest knee transplantation only after less invasive procedures have failed to produce the desired pain relief results. Medicines, weight loss, assistive devices like knee brace or cane and physical therapy are the procedures used by doctors as the first line of treatment for knee arthritis. There are a number of important factor that doctors consider prior to recommending knee transplantation to their patients. They consider how much the knee pain of the patient is interfering with his or her daily activities like climbing stairs and walking. Doctors also consider the age of the sufferer and his or her overall health before suggesting this procedure. Doctors into this field evaluate each patient individually prior to recommending knee replacement. Transplantation or replacement of the knee is a four-step procedure specifically meant for people above 55 years of age. Young individuals who have their knees transplanted might outlive their artificial knees and might also require revision. Major advancements made in the field of medical technology has led to highly functional and precise artificial knee implants that work the way original knees move. They are also customized to suit the human body. Today, TKR or total knee replacement is considered one of the most effective and safest of all the standard orthopedic treatments and surgeries. Essentially, this is a four-step procedure. The very first phase of this treatment involves the surgeon removing the bone that has been damaged by arthritis or other such causes. The bone is prepared by removing the damaged cartilage surfaces at the ends of the shinbone or tibia and the thighbone or femur. A small part of the underlying bone is also removed. The second step of the surgery is where the surgeon positions the femoral implants and metal tibial. The specialist either pres-fits them or cements them to the knee bone. The artificial implant is strategically chosen for perfectly fitting the knee anatomy of the patient. There are special surgical tools used by the surgeon for cutting the arthritic knee bone properly and shaping a healthy bone underneath to precisely fit into the components of the artificial implant. Here it is important to note that press-fitting are the implants are made with rough bases for encouraging the knee bone to grow into them. This secures the artificial implants naturally. The third step of the process involves inserting a sort of plastic button under the patella or kneecap. This is done for affixing the artificial implant in a better way. This might need resurfacing the kneecap undersurface. The last and final step is implanting a plastic medical grade spacer between the femoral and tibial metal parts for creating a very smooth surface that easily glides and works exactly like an original knee. It is important for the surgeons to align the artificial implants carefully and precisely fit them to the knee bone for ensuring that the end result of the surgery is positive and successful. It is also worth noting that if this surgery remains postponed for a very long time; there are other risks that the patients might be susceptible to. Knee deformities might develop resulting in complications during the surgery. If reports are to be believed, knee transplantation has helped more than 90% of knee arthritis sufferers in experiencing complete reduction in knee pain. Not only this undergoing the surgery has also helped them in improving movement and mobility. Majority of the patients have also been able to get back to their regular activities.